Product design involves a number of safety checks, whether the designer is working on a consumer item or an industrial product. Designers are increasingly interested in measuring the potential injury that would be caused by an accidental impact, to ensure their products are safer than ever and meet required standards..
ETLG Inertial Aerosystems is pleased to announce a new impact testing accelerometer system to support these aims. The data collected offers the same FFT analysis and display capabilities that are typically found on more expensive devices. 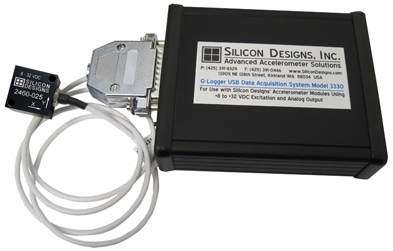 The new Silicon Designs Model 3330 G-Logger system is now available through ETLG Inertial Aerosystems. The system includes up to 3 accelerometers, either single axis, or 3 axis, combined in a rugged enclosure that is connected to a data logging module This compact, portable and highly robust system can be used for repeatable tests. It is an inexpensive and versatile solution, being powered by a single USB connection. Up to 3 standalone, single axis modules. As an integrated triaxial, orthogonally mounted module. The data acquisition module connects via cables to both modules types. Fixed full scale ranges from +/- 2g to +/- 200g, with up to 2000g overload survival are on offer..
Users do not need to purchase a separate power supply unit for the accelerometer, since power is drawn through the USB connection. ETLG Inertial Aerosystems is a supplier of magnetic sensors, tilt sensors, accelerometers, gyroscopes and related equipment. Clients are predominantly in the auto industry, defence and military organisations. The company was founded in 1990 and offers a range of products and relevant technical support. It holds ISO9001:2008 & AS9120A certifications. For more information, please contact ETLG on 0203 258 0023.